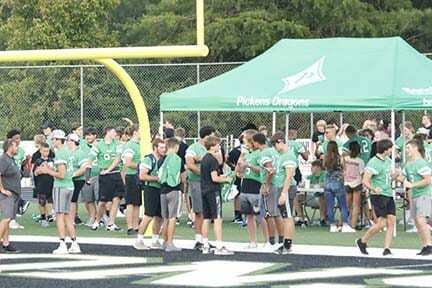 The Dragon football program held their 2018 Meet the Dragon event on Friday and excitement for the 2018 season filled the air. With Kindergarten through 12th grade participating, the afternoon started with the high school varsity scrimmage followed by junior varsity, ninth grade, eight grade and seventh grade. The Dragon youth teams also held scrimmages with the 6U and 7U, 8U and 9U, and finished up with the 10U scrimmaging the 11U. Head varsity Coach and Athletic Director for Pickens County said the he was really excited to so many from the Pickens County area show up not only to support these athletes but also to support the Dragon program as a whole. Through out the evening, fans enjoyed jump houses and shaved ice from local vendors that support the dragons. Concessions were also available as well as raffle tickets for purchase with all proceeds going to assist the Dragons in purchasing both equipment for the players and other things needed to make a football program successful. At the end of the Meet the Dragon event, a silent auction took place to further support the Dragons. In the silent auction, last minute bids started with hopes of getting that special item and bring even more funds to the Dragons. One of most exciting times in the evening was the 6U and 7U teams taking the field to scrimmage each other. 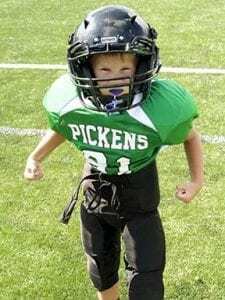 If you have ever seen these age groups play you know that sometimes the helmets are bigger than the players but this did not stop these super young athletes from getting after it. These little guys did very well in making tackles and running the plays that their coaches have been showing them. The Dragon program looks really good for many years to come. It is obvious that some will move away and some will stop playing football to possibly move to other sports but either way someone will get good athletes in the future. Over 400 players and cheerleaders participated in the event with at least twice that in attendance. The fans were very pleased with the execution of the event and look forward to next year’s Meet the Dragons for 2019. 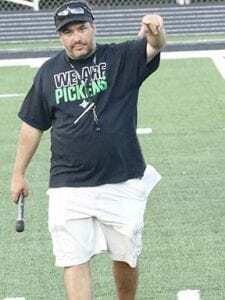 This season kicks of on Thursday August 9th as the Middle School welcomes the Indians of Lumpkin Co into Dragon Stadium for a scrimmage and the high school will hold their preseason scrimmage the following night as they take the field against Denmark High School out of Forsyth Co.